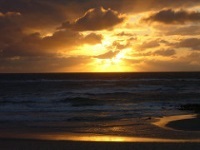 The island of Sylt is Germany's most northern point, lying off the northwestern coast in the North Sea. The island boasts some lovely sandy beaches and stunning views, and its main town, Westerland, has become a popular seaside resort. Other sought-after villages are Kampen and Wenningstedt-Braderup. In recent years Sylt has become the seaside destination of choice for the German rich and famous and celebrity spotting is a regular activity for some tourists. The island has miles of bicycle paths meandering through pine forests and is a popular place for horse riding too. Sylt offers plenty of entertainment for tourists, including shops, spas and exclusive restaurants. There are also a number of golf courses. The Ellenbogen Nature Reserve is a lovely area for walking and there are two lighthouses to explore as well as wonderful dunes. Although most visitors come to enjoy the beaches and outdoor activities in pretty Sylt, other popular tourist attractions include the Sylt Aquarium, which is a good place to take children, and the small but historically interesting Saint Severin Church. Sylt is easy to get to and trains arrive several times a day from Hamburg. The island is connected to the mainland by the six-mile (10km) Hindenburgdamm Bridge.